Bolts won't help those 90* corners fit inside the dash. Though I agree. 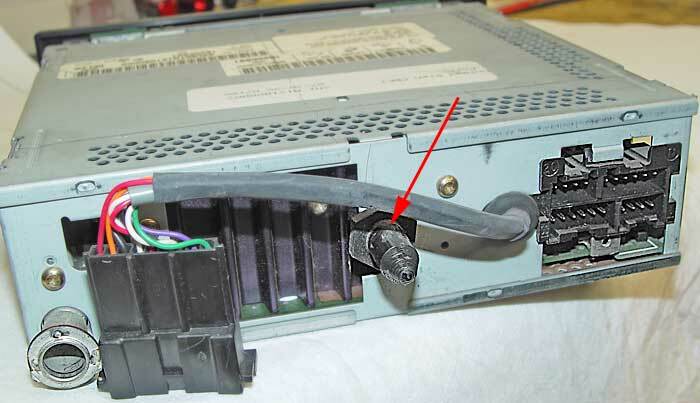 There should be screws that fit into the bottom mounting holes that the OEM nav utilizes. Then you could have covers that pop over them. I'm guessing that would add a few dollars per unit though to produce. On the units like my Seicane with the dvd player included you add a screw in post or a bolt with the head cut off to the back of the radio. Once you do that it acts as a stud going into the place the factory radio was designed to go into supporting the back of the radio. No more sag. Bolts won't help those 90* corners fit inside the dash. In some instances you can remove the stud from the OEM HU and re-install it on the new HU. I'll check my new unit to see if it has that stud hole. They are "generic" images - they may not apply to your (our!) situation. The Seicane that's in our E53 has been flawless for us. It looks about as factory as it gets and if your going from the single cd radio its pretty easy to install. Well besides the dash trimming. Any double din replacement will require the dash to be trimmed. 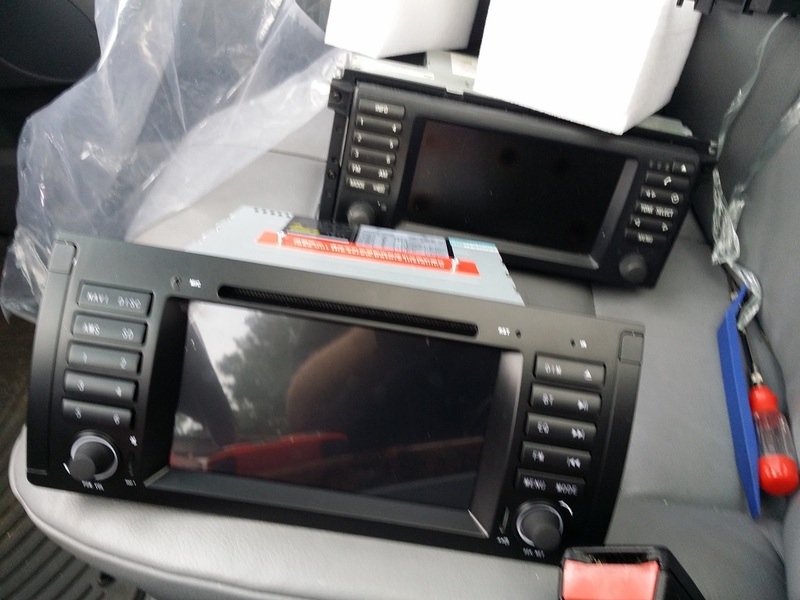 The radio in this pic that's in the foreground is the new Seicane aftermarket radio. The radio in the background in the factory radio I removed. Doesn't get much more factory looking than that. Just my opinion but the Avant 3 looks even closer to the factory unit. I have considered it, but like I said, doesn't bother me anymore. It *really* doesn't bother me when the daylight only lasts for 7 hours. I've been trying to find a picture of the rear of the OE nav screen, showing the rear support stud - finally found one. A picture is worth a 1000 words (of mine, anyway!). 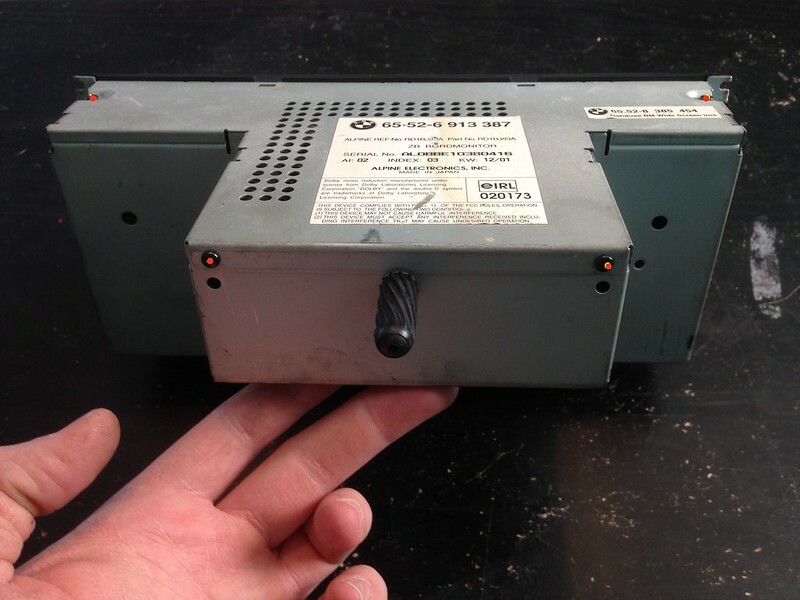 With a rear support such as this, there should be no need for lower screws on the front panel or other methods to wedge the new unit in place. Nice picture - it's my car when I upgraded my head unit. To the fellow who wants CD and phone and more, that is what I wanted and accomplished. Look for my thread, pictures, etc. If you get stuck - PM me and I can help more.